"Mickey Blue Eyes" is one of those movies that wouldn't last 20 minutes if the main character wasn't a certifiable moron. A comedy of the uncomfortable, it's predicated on Hugh Grant, playing an tentative, English, auction house proprietor in New York, allowing himself to become embroiled in the mob when he unknowingly proposes to a mafia princess (Jeanne Tripplehorn). She declines, crying her eyes out and explaining her background and the family she's tried to put behind her. Romantically, he says it doesn't matter. She exacts one promise from him: That he won't agree to do any favors for her family and won't accept any, either. "That's how they get you," she says. "Then you'll be one of them." So when her mobster father (James Caan) comes calling after intervening (uninvited) in an auction house shipping dispute, and asks Grant to include in an art auction a violent and hideously amateurish painting by the mob boss' son (for the purposes of money laundering, no less), all he has to do is say, "I'm sorry, I can't. I promised Gina." But with that kind of integrity and common sense this movie would have no plot, so Grant auctions the painting (appalling the upper-crust art collectors in attendance), lies to his fiancee, and the allegedly funny downward spiral begins. "Note to self," Grant says into a minicassette recorder, "rent 'Casino,' 'Goodfellas,' 'Godfather' 1, 2 and 3." Before long he's inadvertently involved in a murder, forced to pass himself off as a gangster (mangling the pronunciation of "fuhgetaboutit," et al), under investigation by the FBI and running from hit men -- all of which might have looked funny on paper but disintegrates in the hands of sophomore director Kelly Makin ("Kids In the Hall: Brain Candy"). Makin depends heavily on the assumption that a Hugh Grant-in-the-mafia picture will just be inherently hilarious, and he's dead wrong. The featured comedy set pieces -- like Grant's panicked, emergency crash course in mafia slang -- are laugh-free flops, and on a more basic level, his character is fundamentally unlikable because he's a liar and a milksop. 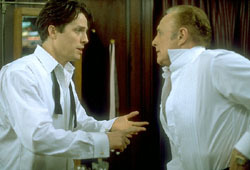 But "Mickey Blue Eyes" ultimately caves in because the only tent pole holding it up is the way the characters avoid honesty and reason like the plague, because honesty and reason would bring the story to an abrupt halt before the asinine climax, in which Grant fakes his death at his wedding. Of course, he doesn't tell his bride about the plan, which makes her look like an even bigger idiot than he when she takes him back for the inevitable happy ending. "Mickey Blue Eyes" isn't a bad concept for a fish-out-of-water flick, but a similar idea worked much better in "Analyze This" -- out on video this week -- which was at least occasionally funny. The only real laughs here come from very intermittent asides, like the mention of a suspicious fire at rival auction house Sotheby's. "You're welcome," Grant is told, with a nudge-nudge, wink-wink. Hugh Grant seems to have spread himself too thin on this picture, dedicating more energy to producing (with girlfriend Elizabeth Hurley) and script doctoring (he did the final draft himself), than to acting. Save a few witticisms during auction scenes, Grant's character is almost devoid of the once irrepressible charm he has built his career on in such movies as "Four Weddings and a Funeral" and this summer's "Notting Hill." James Caan is the movie's singular high point, as the matter-of-factfully menacing father-in-law, who is more than happy to show Grant the ropes of the family business, whether he likes it or not. How about a mob comedy with this guy and De Niro, doing his nervous nellie ne'er-do-well from "Analyze This"? But then, just about anything would have been better than "Mickey Blue Eyes," which strains the definition of comedy to the point of being painful. Truth be told, the fact that I was to interview Grant a few days later was the only reason I didn't walk out on this failed farce.